From Booklist: “These pint-size companion books will delight active toddlers…The playful rhyming language is short and sweet, just right for the young target audience, and Courtin’s childlike illustrations are also on the mark, providing comforting scenes of tender family fun that youngsters will page through on their own.” –Lauren Peterson, © American Library Association. When I was a teacher, I noticed that young children like to use adult bodies as furniture: a place to sit, climb, or lie down. My own kids can’t resist jumping on my back if I’m down on my hands and knees. So I wanted to write a story about how grown-ups are part of a child’s landscape. 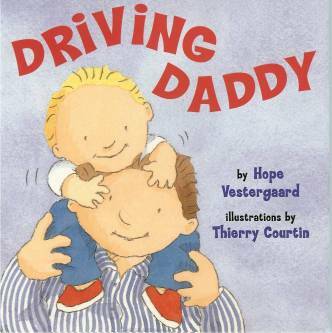 I started two different versions: one about a toddler driving his dad, and another about a baby climbing up his mom in the bed. The rhythms worked out better in the story that I was then calling MAMA MOUNTAIN, so that’s the piece I polished up and sent out. My agent sent it to Stephanie Owens Lurie at Dutton Children’s books. She said, “I think this would be nice with a companion book. Could Hope do something about a child and a dad?” I pulled out DRIVING DADDY and polished it up. And that’s how an idea turns into a story (or two!) and turns into a book.